We all know it. Scott Lang is a great guy, but he might not be the most well-suited person to use the Ant-Man suit. Well, thank goodness Hank Pym finally figured that out! He finally let his daughter, Hope van Dyne, use his technology to become the superhero she was born to be. With her new suit, she’s become the Wasp! Of course, she has all of the powers of Ant-Man, except she’s a better combatant and she can fly… why do we even need Ant-Man around again? Hope van Dyne teaches one valuable lesson! No matter what sort of obstacles stand your way, if you work and fight through them, you can overcome anything… even an overbearing father! 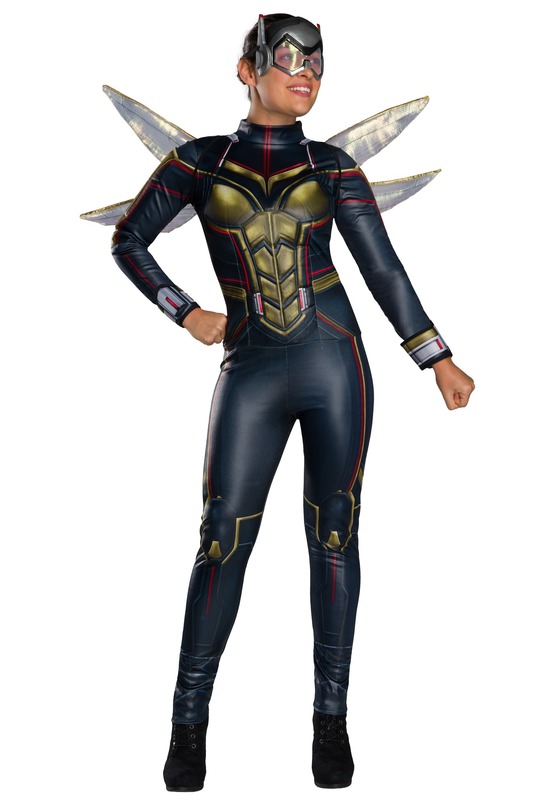 Now, you can be like her when you become a superhero with this Wasp costume! This women’s Wasp costume is officially licensed from Ant-Man and the Wasp. It comes with everything you need to feel like an unstoppable superhero in the Marvel Universe. The full-body jumpsuit is dark blue with printed gold and red armor details on the front. Of course, you won’t want to fight the bad guys without a mask! The mask has a visor over the eyes and fits with an elastic band in the back. To get the full look, you’ll want to pick up the Wasp wings (sold separately). When you dress up in this Wasp costume, you’ll be ready to head on a super-secret mission! Your first objective? Head to the costume party and kill it as one of Marvel’s greatest superheroes. And if you’re looking for a great couples costume, be sure to check out our adult Ant-Man costumes!